Here are some nice things Pearl’s adoring readers have said about his new book. For the record, Pearl likes these VIP fans very much. His proud Mommy does too. A refreshingly unique and beautiful love story, “Love & Feathers” is a laugh-out-loud page turner. Even if you aren’t enthusiastic about birds, you will be about this book! I have always loved all animals, but birds have become my heart. And that is why I like your book so much. You touch the bird in me. With wit, depth, and a ton of heart, Love & Feathers teaches some of life’s most important lessons. Shannon’s “Lessons with Wings” at the end of each chapter could be a stand alone, daily book on their own! This is a sweet, touching, soulful, and relatable read. Love and Feathers is a delightful account about love in its most purest and literal form. It is a story about finding your destiny just as you should; suddenly, when you least expect it. Cutts’ relationship with Pearl exemplifies true love. With flawless and comical prose, she allows her readers to see how life can be unequivocally enriched when you can love someone and be loved in return. Pearl and Shannon are two soul mates who share six wondrous things: trust, surrender, sufficiency, peace and endless potential. I adored this book. Love and Feathers is a joyful journey filled with compassion and wisdom. Shannon shares how a pet, Pearl (who happens to be an avian), can teach us the skills we need to overcome adversity and live our lives to the fullest. Life with Pearl is full of humor, insight and inspiration. A must read for all pet lovers! Love & Feathers took me on a heart-warming journey into the intricacies of avian-human companionship. Shannon’s wit is guaranteed to paint a wide smile across the reader’s face as she leads them deeper into the adventurous landscape of the relationship between parrot and parront. I was especially intrigued with how Pearl’s life was shown to be an example of how we could also enjoy our own life – and at such a simple and basic level. Those who truly treasure their avian family members will surely grin, giggle and even sigh as they relate to the antics of Pearl. Trust me, you will relate. Oh how I eagerly await the reality show! I have followed the exploits of Pearl for over a year now, watching with well-deserved admiration as he trains his human Shannon in the ways of cockatiel service. It is only fair, then, that Shannon should have her chance to share the human side of parrot servitude. This she does with humor and grace, interweaving facts with experience so well that even the most novice of parrot admirers will understand completely the trials and joys they’re in for. It’s all here, from how to feed a cockatiel to those all-important veterinarian visits, all while projecting a semblance of sanity. Spoiler alert: very near the end of this surprising book, Shannon writes, “If I want to have a relationship with God, I must seek first and only this: a relationship with love.” I cannot possibly find a better way to describe this book. Love & Feathers is certainly the story of the relationship between Shannon and her beloved parrot, Pearl, but it is first — and ultimately all — about love. Buy two copies; you are going to want to give it to someone immediately. I ‘flew’ through Love & Feathers – I loved it! Thank you, Shannon and Pearl, for sharing lessons on what really matters in life – love, and living in the moment. For evermore, when I see a parrot, or indeed any bird (or human), I will look beyond the feathers and seek to connect with the love within. 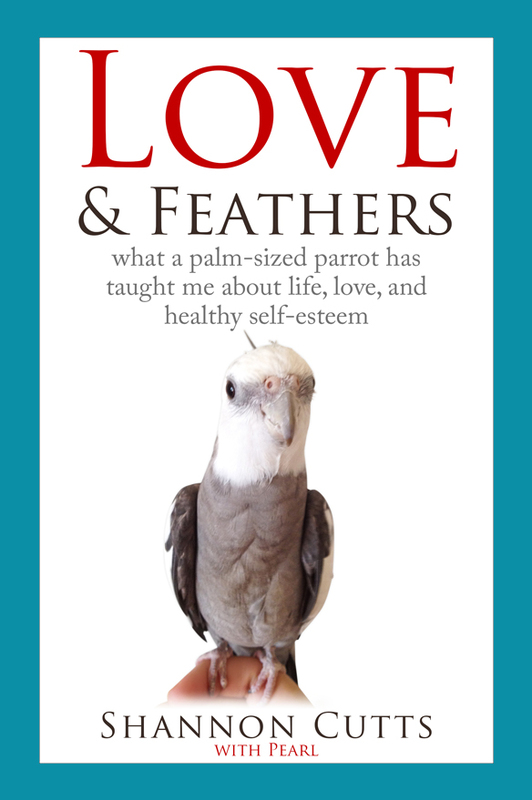 Love & Feathers is filled with compelling stories about how Shannon’s parrot helps her to see aspects of her life from a different view, which fuels her self-growth. It serves as an incredible reminder that many of life’s most powerful lessons can be found in the simplest of places. Ready to order your beak-o-graphed copy? Get it "right away, no waiting" - just the way Pearl likes it!